Watch the person ahead of you in the checkout line next time he or she signs for a credit card purchase. Chances are that the mark put on the screen will consist of a short illegible scrawl that probably bears little or no relation at all to their name. But this is where we’re going in the 21st century. We’re already well into a new era when handwriting is such an archaic idea that even schools are dropping the requirement. Who needs cursive skills when all communication is tapped on to a computer keyboard or punched into a telephone pad? Taken away from the computer and given a paper and pencil, kids today are more likely to print than they are to write. Printing is fine but it’s a painstaking process and can’t compete with writing longhand when something more in-depth is required. Georgia is considering no longer teaching cursive writing, and 41 states have adopted the so-called Common Core Standards for English that don’t include it. 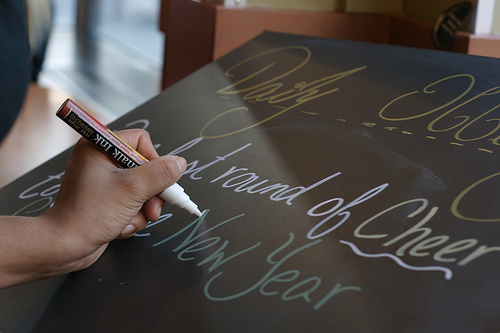 About the only place you’ll see any attempt at artistic, flowing prose these days is outside of restaurants and coffee shops where managers use a chalk board to advertise the day’s specials. Even then most of the letters are drawn independently and sometimes in different colors so that they catch the eye of passersby. Be glad you’re not a handwriting analyst for a big city police department or the FBI. This is a profession that must be getting hit hard and it’s probably the number one topic of conversation at their conventions – which they could hold in a phone booth these days (if they still had phone booths). Now, of course there will be consequences and repercussions, as Eddie Murphy used to say. For one thing, teaching handwriting to young children helps them develop fine motor skills. “It’s the dexterity, the fluidity, the right amount of pressure to put with pen and pencil on paper,” Sandy Schefkind, a Maryland occupational therapist, told The New York Times. Second, many historical documents are written in script, and it would be a mistake for future generations to be unable to read and study originals. Third, I don’t like the idea of throwing another one of our basic education skills to the wolves. I still think there should be more of a focus on foreign languages, maybe Latin. My suspicion is that teachers spend wildly inappropriate amounts of time preparing students for standardized tests that only serve to make the politicians look good. But my main concern in eliminating handwriting instruction is that future generations may be largely incapable of communicating without the assistance of a computer or some other electronic device. If we keep going down this road, we won’t even be able to figure out which latte is on special at Starbucks unless it’s typed out on a marquis. PIVITOL WEEK FOR PRO-FOOTBALL (the crime rate depends on it): As we head toward the big Fourth of July weekend, everyone wants to know. Will there be an NFL season? CNN would like you to think people are preoccupied with whether Congress will approve an increase to the debt limit but really, that’s a distant second. If there’s a U.S. financial default and interest rates leap to 12 percent, will there be panic in the streets? Not a chance. But what if there’s no Hall of Fame Game … no opening day matchup between the Packers and the Saints? Bar the door or at least stay close to home, apparently. An NFL lockout may result in some additional criminal mischief on the street, but at the same time it could save some victims of domestic violence. A study released this spring by the University of California, Berkeley, looked at 900 NFL games and compared the rate of unexpected team losses to domestic violence cases. 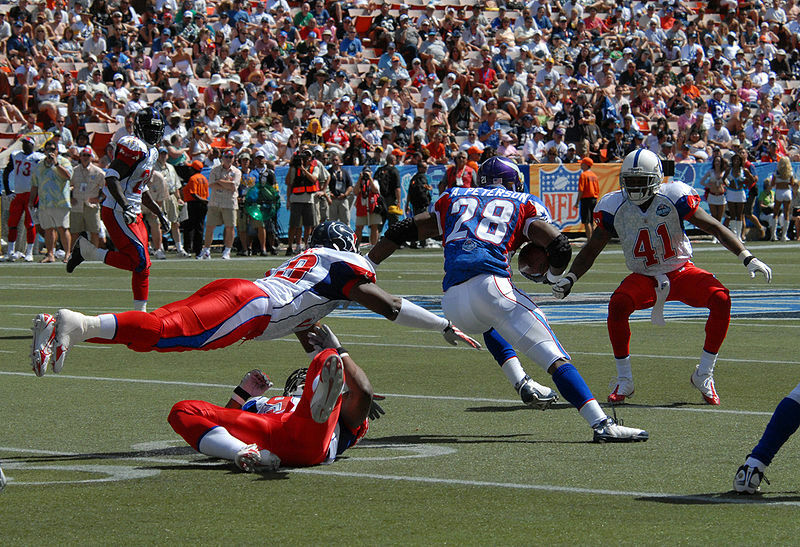 The researchers focused on the Detroit Lions, Kansas City Chiefs, New England Patriots, Tennessee Titans Denver Broncos and Carolina Panthers. They found that when a favored team unexpectedly loses, there’s an 8 percent increase in hometown domestic violence cases. In Massachusetts, with a population of 6.5 million, that’s roughly seven incidents that wouldn’t have happened otherwise. Clearly a country that obsessed with football needs a breather. Hey, why don’t you guys take another year to think about that contract? Speaking of second thoughts, the American Medical Association is suddenly regretting its 2010 decision to back the Affordable Health Care Act. At its annual House of Delegates meeting in Chicago over the weekend, the organization disclosed that 12,000 members dropped out – presumably over the law’s health insurance mandate. Membership now stands at 216,000, which represents a 5 percent loss in just two years. Members who attended the meeting became embroiled in “a heated debate” over the issue, the Chicago Tribune reported Sunday. My comment: Who are they kidding? Medical advances continue. But there has been precious little innovation in the business of delivering health care in the United States. It’s easy to knock something down. If you don’t like the Reform Act, come up with a better alternative. Here’s one guy’s alternative idea for accessing health care: He robbed a bank. The Gaston Gazette in North Carolina reported Thursday that a 59-year-old unemployed man desperate for medical attention walked into a bank and handed the teller a note demanding $1 and then calmly sat down to wait for police to take him into custody. He has an unexplained protrusion in his chest and had run out of money for rent, food and other necessities. You might wonder, like I do, why we can’t have a more level-headed, fact-based debate in this country during election cycles. Not much is ever accomplished by continually painting political opponents as evil and underhanded, with hidden agendas that will subvert the basic foundations of the American system and lead us toward totalitariansim, communism or fascism (pick one). But it turns out that there is good reason why candidates and the architects of their campaigns tap emotions among voters rather than discuss dry, complex issues. A new study at the University of Michigan shows that nothing motivates voters more than good old fashioned anger. In the study, participants were asked to write about something that made them experience one of three emotions during the 2008 elections – anger, anxiety or enthusiasm. Their participation in the campaign was then judged by one of five actions: volunteering for the campaign, donating or soliciting funds, attending a rally or wearing a campaign button. Valentino and his colleagues found that anger — but not anxiety or enthusiasm — tripled participation in one of these five behaviors. Anger was “strongly related” to who actually got out to vote in 2008. But the researchers also analyzed historical data from elections in 1980 through 2004 and found that throughout the years, anger has consistently boosted participation in the election process. has become so important in campaigns. You may have a candidate with good ideas, someone who connects well with voters and charms the faithful at rallies. But those qualities alone won’t bring home the bacon without stirring the pot and reminding people why they should be fuming. Yes sir. You should be mad as hell, and you’re not going to take it anymore. Since the root of anger is usually injustice, taking time to point out how groups of voters have been wronged by incumbent leaders – or how they might be wronged by their opponents – can pay big dividends. For example: They have picked your pocket or are going to pick your pocket; you can’t even walk down the street in safety anymore; you work 12 hours a day while somebody else collects a government check; you have no retirement plan while some worker at the state capital gets to retire at full pay. Sure, anger plays a role in every election, always has and always will. But there’s an abundant supply these days as we saw last year in the congressional elections and expect more of that in 2012. That means brace yourself for an even more vitriolic campaign with more figerpointing, angry campaign signs and slogans, more foaming at the mouth speeches. 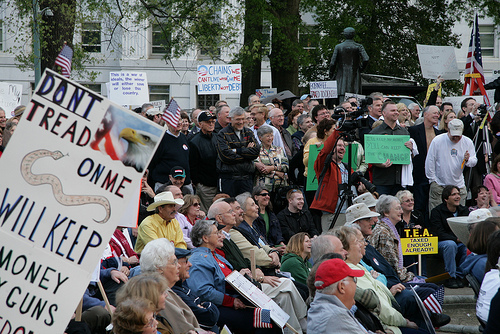 We can expect the Tea Party to do exceptionally well in the coming years since no other political movement is so adept at tapping voter anger. In fact, anger was and still remains the basis for the success of the Tea Party, which now essentially controls the House of Representatives. There is widespread anger over economic issues, housing, inflation and employment. Americans feel that they have been suffering through great injustice and I’m sure savvy campaign organizers are already getting the ad copy ready for next year’s festival of anger and disgust. Political campaigns are like car wrecks. You know you’re probably going to see something disturbing but you feel compelled to look anyway. This one may be particularly unpleasant to watch. Some of the papers gave President Obama the business over the weekend for lunching at a Toledo hot dog joint the day after his wife Michelle helped launch the USDA’s new “My Plate” campaign to promote healthy eating. So days later here’s the prez at Rudy’s Hot Dog in Toledo enjoying his food but eating more; deliberately ordering oversized portions and subbing deep fried taters for steamed veggies. The MyPlate website advocates replacing “Deep fried French fries” with “Oven baked French fries.” But Obama was photographed at the scene of the crime: taking a heaping plate of fries from a server glistening with grease. He might as well have ordered a chocolate shake, too. I doubt that Michelle Obama ever said: “Thou shalt never eat a chili dog.” She’s probably eaten her share of fried chicken on the election circuit. But that aside, Americans love to see their politicians involved in bad eating habits. It means they’re just like us. Clinton got a lot of mileage out of eating fast food, especially burgers and donuts. Lunch at Rudy’s will probably help him collar more votes in Ohio than all the speeches he’s given in the past six months. On Rudy’s Facebook page, a patron said: I was one of the fortunate ones who was in the restaurant when the Secret Service arrived just ahead of the President. He DID pay for his own meal along with Mayor Bell, Marcy Kaptur and Sharrod Brown’s. Posed for photos with people who had cameras/cell phones and took the time to talk to every person in the restaurant. 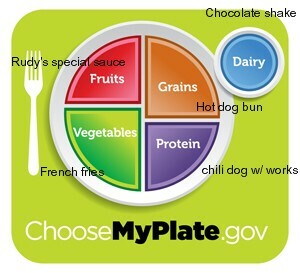 Image: USDA MyPlate graphic as reflected by the president’s Toledo lunch.